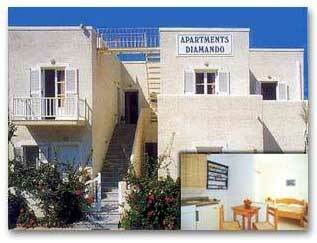 Diamando Apartments are located in the town of Parikia, just 5 minutes from the old town, the bars and the beach. The hotel offers 7 fully equipped apartments offering kitchen and balcony. Each unit is air-conditioned and has a TV. The apartments are very conveniently located offering easy access to super markets, taverns and the bus stop. Hotel Rooms: 7.